We're confident you'll find our staff will meet and exceed your expectations! Several of Dr. Gerds clients have followed her throughout her career and still bring their pets to her. Many of these people began as customers and they remain friends today. That says something. Advanced Care Pet Hospital is dedicated to setting a high standard of veterinary care. From advanced diagnostic testing to considerate, caring staff, you will always feel you were treated well while here. 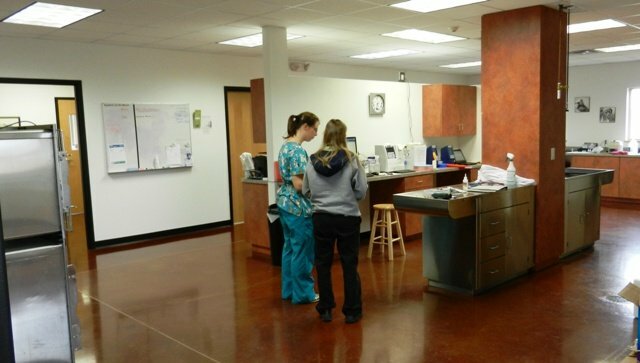 The veterinary staff takes the time to ask you questions about your pet's health and well being. Many new customers tell us they've never experienced this level of care previously. It's why most people recommend us to others. People compliment our staff on the way they and their pets were treated. You get the feeling the staff really does care for the pets and it's not just a job. Can't say enough good things. Both of my dogs have gone to Advanced Care Pet Hospital since I moved up to St. Cloud received nothing but top notch care. Everything from nail trims, to routine checkups and even a surgery for bladder stones, and it has all been handled quickly and professionally. Also, one of my dogs is on prescription Royal Canin food for his bladder stones, which can be expensive, but they manage to have the best prices I have found both locally and on-line. They also have great weekend hours which makes them more convenient than other vets I have visited. Before your first visit, gather any previous medical or adoption records you may have. Our staff reviews this information to update the pet's medical record. We don't wish to duplicate what's already done. An accurate record of your pet's medical history helps form the best treatment plan for your pet going forward. Please bring your pet in a carrier or on a leash. This reduces the possibility of any negative incidents with other pets or escape attempts. Recently we had a cat owner arrive who didn't fully latch their carrier. The cat bolted from the unlatched carrier and escaped right from our parking lot. Fortunately the cat showed up at home a day later. The link here has excellent info for Cats. At your pets appointment, our Veterinary Technician will meet you and your pet to an exam room and ask you questions regarding your visit and any health concerns you may have. Your pet's weight, temperature, and a quick check of your pet might happen at this time as well. When Dr. Gerds examines your pet, she will take the time to listen and ask questions so she can understand your concerns. She will perform a physical examination of your pet - checking the eyes, ears, and mouth and listening to the heart - and you will be asked questions about your pets’ habits and activities. We will always see your pet the same day if it is sick or hurt! We can easily schedule most routine visits either the same day or a few days out at most. You don't have to wait a week or two to book appointments. This includes surgeries like spays, neuters and declaws. And spay and neuter patients go home to you the same day after surgery. That is because we use the safest veterinary surgery and anesthesia protocol. Major surgeries like TPLOs and orthopedic work etc. are scheduled with board certified surgeons and depend on their schedules. If your plans change please have the courtesy to call us in advance so we may fill that slot with other pets who need our assistance. Please recognize that when you call to cancel we have the opportunity to help others. Our mission is to care for people who care for their pets. We have a great deal of respect for people who respect other people's time. We respectfully remind you that payment is due at time of service. We do not offer credit or payment plans. Advanced Care Pet Hospital accepts cash, all major credit and debit cards. If financial assistance is needed, we accept CareCredit®. Find out if you qualify for CareCredit® by applying online, visit www.carecredit.com/vetmed. CareCredit® payment plans are interest free as long as you pay off the balance in the term agreed upon. Our Client Service Representatives will be able to assist you with any questions you may have. Can I get pet health insurance? Yes, third-party health insurance is available for pets. As with human health insurance, different companies offer various levels of coverage that have a wide range of deductibles and premiums. At present we have no preferred or recommended provider to suggest. For most surgeries including Spays and Neuters, your pet goes home the same day after surgery, we do not require and overnight stay. We look forward to meeting you and your pet. We believe here you will find the level of care and consideration you both deserve. If you have any questions about your upcoming visit or procedure, please call us.